Pre-harvest interventions, adequate sanitary dressing procedures at slaughter, and adequate sanitary conditions during further processing are a part of an integrated approach to reduce the public health impact of Salmonella and Campylobacter in a poultry processing plant, writes Chris Harris for ThePoultrySite. These pathogens are a hazard that processing plants producing raw poultry products should control through a HACCP plan or prevent in the processing environment through a Sanitation Standard Operating Procedure (SOP) or other programmes. Use microbial testing results to monitor the performance of their HACCP system and inform decision-making. While rates of foodborne illness overall have fallen, Salmonella rates in the US have remained relatively stagnant, which has prompted FSIS to take an all-hands on deck approach to addressing the pathogen in meat and poultry products. The guidance, along with development of new performance standards for raw chicken breasts, legs and wings as well as for ground and other comminuted chicken and turkey products unveiled in January, are a major step in FSIS' Salmonella Action Plan. FSIS says that its science-based risk assessment estimates that implementation of the new performance standards will lead to an average of 50,000 prevented illnesses annually. 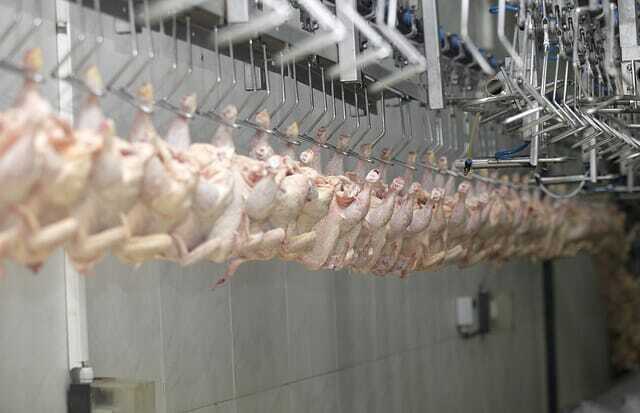 How well a poultry processing plant conducts its slaughter dressing procedures has a direct bearing on whether the decontamination and antimicrobial interventions in the operation will work effectively. FSIS says that whether a processor’s food safety systems are effective as the hazard analysis programmes lay down relies on monitoring and documenting the procedures and having effective intervention treatments at slaughter. Problems of Salmonella and Campylobacter contamination can start right at the start of the process when the bids are received into the plant and during the hanging on the line. As the feathers, skin, crop, colon, ceca and cloaca of the birds brought to slaughter are often highly contaminated with Salmonella and Campylobacter the crates and cages that they are brought to the plant in can be sources of cross contamination. Wash down of the cages and strict disinfection regimes at this point can help to reduce the threat despite being a cost in time, money, labour and water. At this early stage, plants should also monitor and restrict the movement of staff, who might transfer contamination from these “dirty” areas to “clean” areas within the plant on boots and clothing. The FSIS guidelines suggest that action taken on the farm by having good feed withdrawal practices can reduce problems with excess faeces that might be expressed during the hanging, stunning and slaughter process, reducing the levels of Salmonella and Campylobacter on the carcase and feathers that get carried forward to the subsequent stages of the slaughter process. While stunning reduces struggling and convulsions, wing flapping and quivering that happens because of the electrical stunning can transfer bacterial pathogens from the inside to the outside of the bird and to nearby birds and equipment. Poultry processing systems manufacturer Marel stressed the importance of ensuring high safety protocols at the start of the line. “Attention to food safety starts at the very first beginning of poultry processing, the condition of the supplied birds: a dry, stress-free and injury-free chicken in good shape will have much less chance of cross contamination. Regarding bacterial infection, there's a very close relationship between what comes in the processing plant and what goes out,” a spokesman for the company said. “Another point of attention at the beginning of the process is the transport of live birds. Transport modules and trucks need to be clean to prevent contamination from one farmer to another. Strong emphasis will be continuously placed on food safety, up to the cold storage and transport of end products. "The complete processing chain should focus on food safety to achieve the highest quality possible. When the start is right and process discipline is respected from beginning to end, the risk of cross contamination is at its lowest. “The foundation of securing food safety is also formed by the right layout of the processing plant. The processing departments should be separated, while logistics and product flows should be optimised. Ventilation flows, temperature and humidity should be secured for optimal conditions. In fact, the entire building should be constructed with food safety in mind. Following stunning and slaughter, the next process on the line of scalding to loosen the feathers can be seen as a two-edged sword. In some circumstances, the scald tanks in which the birds are immersed can act as a carrier for bacteria to transfer from one carcase to another. However, it can also help to reduce levels of Salmonella and Campylobacter as much of the dirt, litter and faeces are removed. Much can now be done through the technology that now exists to reduce the potential for contamination in the scalder. For example, Dutch poultry processing equipment manufacturer Meyn has developed the jet stream scalder that has a unique water flow system that pulls the carcases down in a stream that moves with the line direction. As the water floats with high velocity along the entire skin, the heat exchange is optimised resulting in a shorter processing time. The water not only pulls the bird down, but also makes it move along with the line direction. This way, scalding at high line speeds is no longer an issue as products are not dragged to the surface and scalded on only e.g. one side. The Meyn jet stream scalder delivers an extreme uniform scalding result, independent of weight range or line speed and the company says that it is easy to clean without any dirt traps. Scald water that contains high levels of faecal contamination is a problem, as the bacteria gets massaged into the skin and open feather follicles. A bird brush and washer used before the scalding process can help to reduce contamination and the use of counter flow systems in the scald tank and multi stage scald tanks that see the birds moving into ever cleaner water can help to reduce contamination. The pH of the water also needs to be tested as a high alkaline content in the water the better for reducing Salmonella and Campylobacter contamination. FSIS says that scalding can be used as an intervention if the pH is properly maintained in the scald tank. Most poultry processors in the US prefer a hard scald to a soft scald, which has a shorter scald time at higher temperatures. This allows better removal of the outer layer of skin. The correct water temperature for the appropriate amount of time is important to prepare the carcases for feather removal. It also reduces defects during dressing. When the water temperature is too high, the carcases become oily. This oiliness makes it easier for Salmonella to stick to the surface of the skin. Also, if carcases are over-scalded, the meat may start to cook, and the carcases may be marked unacceptable and rejected by inspectors. If the temperature is too low, the tank becomes a breeding ground for bacteria. Good process controls during the picking to remove the feathers are critical as cross-contamination occurs through contact with contaminated rubber picking fingers and contaminated reuse water. There needs to be regular maintenance and sanitation of equipment at this stage of the process including prevention of a build-up of feathers. The process also sees faecal material released when the picking fingers agitate and rub the carcases, leading to potential for cross contamination. FSIS recommends that in US plants post-feather removal rinses should be maintained at 160°F and chemical rinses such as chlorine, acetic acid and hydrogen peroxide can be used. The spokesman for Marel said: “First of all it is most important that the input of live birds is as clean as possible. The farmer should make sure that the birds are treated in optimal conditions. “There are two stunning possibilities; water bath stunning and controlled atmosphere stunning. Water bath stunning can contaminate the product via water to a certain extent, but to my personal interpretation the direct influence of a water bath stunner on the micro-biological end quality is limited. Nevertheless, controlled atmosphere stunning has considerably less risk of contamination. The new Marel Stork AeroScalder, which will have its US launch at the IPP, virtually prevents cross contamination in the scalding process; it doesn't make use of immersion, but blows moisturised hot air onto the products. “Pickers have the key job to eliminate micro-organisms through feather and manure removal. Picking needs to be done profoundly, processors should not risk applying too less picking machines in relation to capacity. The next critical point along the processing line is evisceration, because if the viscera is not handled correctly during removal are of employee hygiene practices are not followed correctly an increase in microbial contamination can occur. While feed withdrawal practices can help in reducing potential for contamination, for the evisceration process to work well, carcases need to be placed on the shackles correctly and monitored as they move through the system. Blades need to be kept sharp and attention given to routine and thorough cleaning. The equipment needs to be maintained in good sanitary condition, free from intestinal contents and segments. Automated re-hanging of carcases between the defeathering and evisceration lines can reduce external surface cross-contamination. The time between picking and chilling has to be as short as possible to keep bacteria in their lag phase. “By keeping the water film intact, continuously refreshing it on the product's surface, the process is optimised to prevent bacteria from attaching,” the Marel spokesman said. The equipment that is used during evisceration has to be installed, adjusted and the machine performance calibrated effectively to handle the size, shape, gender, feed digestion capability, and live average weights of the birds being processed. If the machines and equipment are not set up to optimum effect, the gastrointestinal tracts can be split resulting in contamination. “Most important food safety aspect in EV is preventing damaging the intestines when opening the carcase and removing the viscera pack,” said the Marel spokesman. The Stork Nuova eviscerating system not only removes the viscera pack safely from the carcase, it also separates the viscera pack by transferring it to a separate viscera pack line, securing maximum food safety. “Hanging in this line, the valuable organs and by-products can safely and easily be processed,” the spokesman said. The USDA guidance says that equipment such as crop removal devices can easily become contaminated with Salmonella, causing carcases to become cross contaminated and in some operations, at least half of carcase surfaces are contaminated with crop and upper gastrointestinal contents immediately before evisceration. By retracting the viscera from the body cavity, crop and upper gastrointestinal contents can be transferred to the interior body cavity, leaving a potential risk. Carcase rinses or sprays can be effective interventions for removing incidental contamination from the carcase surface during evisceration. Studies have shown that Salmonella prevalence on carcases can be reduced by between 50 and 90 per cent following rinses. However, the USDA says that the poultry processor should aim to implement consistently sanitary dressing procedures rather than rely on carcase rinses or sprays to control pathogens. Research has shown that the incidence of Salmonella-positive carcases can fall by a third when carcase rinses are incorporated into the evisceration process. Rinses can also reduce Campylobacter as well. The advice, however is once again that antimicrobial interventions are not a substitute for consistently implementing sanitary dressing practices. The USDA says that multiple Salmonella and Campylobacter controls throughout the evisceration process are recommended as pathogens are not effectively removed by using one carcase rinse and a multiple approach works best against pathogens. The spokesman for Marel said: “Concerning the process, continuous monitoring of all processes is necessary. Keeping the production processes inline and preventing product buffering ensure a controllable process which maximises food safety. “Maybe even more attention has to be paid to the flow of by-products as well as people and tools, knowing that these can be risky sources of contamination. The design of the process line should observe a clear separation of manual and equipment processes, creating optimal working conditions for both people and machines. “Concerning equipment, the maintenance schedules need to be respected. Furthermore the product range and processing capacity may not exceed the equipment's specifications, especially in the eviscerating department, to maintain maximum food safety. With regard to cut-up and deboning, Marel said that the prevention of cross contamination is an important issue. “During cut up and deboning, parts of products are being surfaced, which were protected by skin or product tissue before,” the spokesman said. “The logistic process should be designed to separate skin on product flows to prevent contamination of sterile skinned products or deboned product parts. The final chilling process at the end of evisceration is the end of the slaughter line where the chilling further inhibits microbial growth.